The principal constituent of the bark of slippery elm bark is the mucilage, similar to that in mucilage-rich linseed. This herb is also rich in vitamins A, B complex, C, and K, protein, and minerals such as calcium, magnesium, and sodium. Slippery elm is astringent and anti-inflammatory. The herb is also nutritive and it stimulates new cell growth. The mucilage lubricates, coats, soothes and protects mucous membranes. Therefore, it is best used to treat problems related to the gastrointestinal tract and the respiratory system. When mixed with water, slippery elm makes an effective topical wound-healing poultice. This herb is considered by the USDA as being a safe and effective demulcent that can be taken orally. 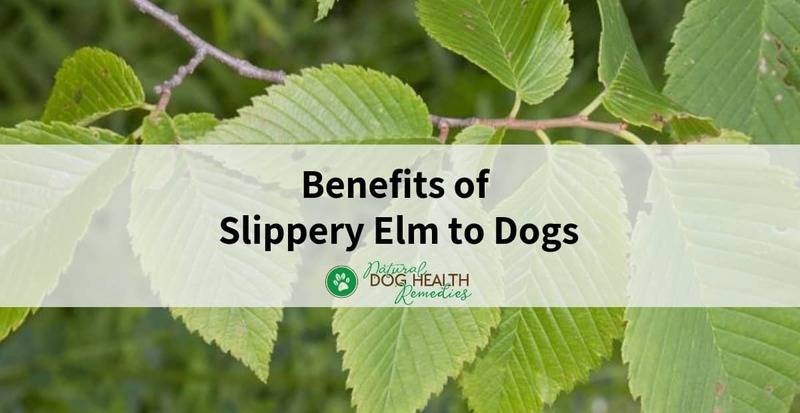 Slippery elm is the ideal herb for treating dogs with a nervous stomach. While it soothes and protects the digestive tract, it is astringent and can reduce inflammation at the same time. Therefore, it can be used in cases of diarrhea, colitis, stomach ulcers, and so on. The mucilage also lubricates the digestive tract to help in the elimination of waste. Slippery elm can also be used to soothe sore throats. The herb's astringent and anti-inflammatory properties make it effective in soothing and treating a painful cough, such as kennel cough and other types of bronchitis. In addition, the herb is nutritious and can be fed to older or convalescing pets as a digestive tonic. Topically, a poultice of slippery elm can be used on wounds, ulcers, boils, or abscesses. Feed the entire mixture to your pet. Combine 1/4 cup slippery elm powder with 2 tablespoon acidophilus powder and 1 teaspoon unrefined sea salt. Add just enough water to make a slippery syrup that can be fed to your dog by spoon or dropper. For dogs with diarrhea, give 1 teaspoon per 10 pounds body weight every 2-3 hours. For a vomiting dog, give 1 teaspoon 5 minutes before feeding the dog. Make sure that the outer bark is not used with the inner bark. Not only will the outer bark dramatically change the medicinal nature of the herb, it will also cause irritation to the digestive and urinary tracts. The inner bark is safe for animals except for rare cases of allergic reactions. However, prolonged use in high dosages is not recommended as it may overcoat the intestinal tract and prevent nutrient absorption. J.A. Duke, The Green Pharmacy Herbal Handbook: Your Comprehensive Reference to the Best Herbs for Healing (Rodale Books, 2000). R. Kidd, Dr. Kidd's Guide to Herbal Dog Care (Storey Publishing, 2000).